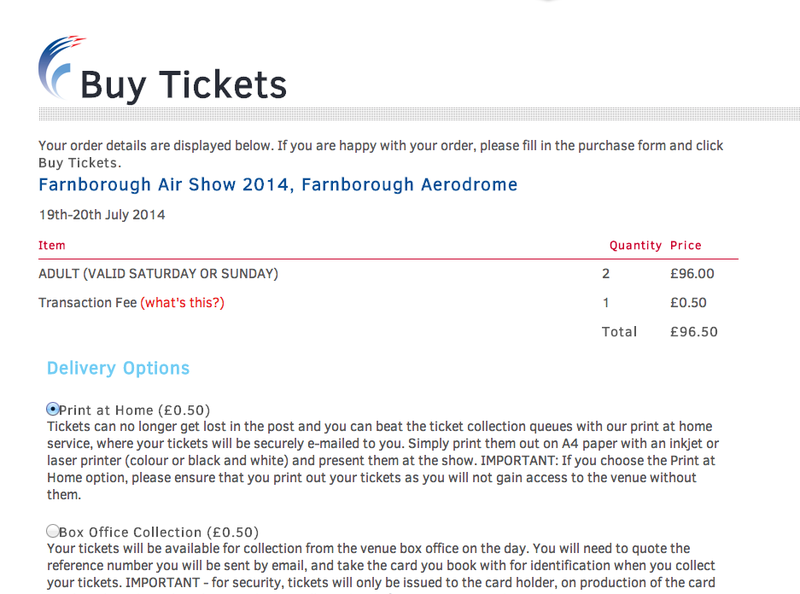 Charged £0.50p to print my own Farnborough Air Show 2014 tickets! 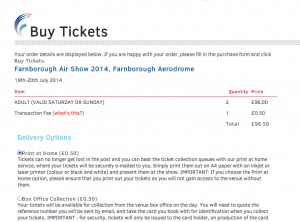 Today, I purchased tickets for the Farnborough Air Show 2014, at a cost of £48 each. As if that wasn’t bad enough, there was a £0.50p charge to print my tickets at home! The charge was the same for collecting from the Box Office. For convenience, I printed the tickets at home, but feel this charge is totally unjustified. I received a spam email earlier this week from a guy claiming to be John from Discover Media, asking to place an article on my blog, with a link to his ‘client’ site. We tailor each article to suit individual websites, and are able to provide the content if necessary and can ensure that it is unique, up to date and relevant to the theme of your website, alternatively you can provide content if you wish. The content would contain one link to my client’s site. What’s basically going on here is he’s offering to pay (as I find out in a later email) $120 to put this article with a link on my site. Although they would probably see the payment through, the problem is, when Google get wind of the fact you’ve sold a link to a spammy site (they can tell! ), they will penalize my site, possibly even blacklist it. TEXT: If there is something that unites all of those businesses that are looking to succeed nowadays, it is an increased awareness of the importance of web design. While you need to provide a good product or service, the first thing people will become aware of when they reach your website is what it looks like and how user-friendly it is, with the internet making it very easy for them to go elsewhere if your site fails this test. Online casino is one sector which definitely seems to be passing the test, but what is it about modern casino site design that presses the right buttons for users? Well for one thing, the best of these sites make the it as easy as possible for new visitors to find what they are looking for – whether it is the contact information, details about security or the different types of games on offer. This is achieved by providing a main page, which is what you will automatically be taken to when you click on the site via a search engine, which contains the links to all of these different parts of the website in one single place. This makes the big online casinos such as new Zealand “<a href=”http://www.casinoonline.co.nz/”>casino online</a>“ amongst the easiest of sites to work out, for those people who have never visited them before. These sites have also cut down on unnecessary frills in recent times – although you will still find appealing graphics depicting various aspects of the casino gaming experience. These are placed on the pages in such a way that they do not distract from the important information though, and they are increasingly being selected to present a classy image, rather than a flashy, gaudy one. The other big change in the design of these sites is the greater compatibility with mobile phones and tablets, through the use of design templates like Cascading Style Sheets, as the top online casinos look to ensure that online and mobile casino services can both be accessed via the one web page. Received this email earlier this week… After some googling, I have determined that it’s a scam, and there’s usually a zip file attached. GMail had removed this zip file though I think. Rejection reason(s): Approval Required Please find enclosed a record of invoice that could not be processed. We would like to ask you to assist us in resolving the noted rejection reasons. Back in October, I wrote about a domain name appraisal scam. It appears this is still doing the rounds, but has changed wording slightly. Now, make no mistake, I know this domain isn’t worth anywhere near $40k, but, to my amazement, a reply! Can you accept 39,000 USD? Haggled me out of $1000 dollars. Damn. sorry, I meant to say $40, but $39,000 is great! thanks. yeah, I’ll sure do the appraisal now.